Celestic Town is quite small and quite easy to navigate. Go into the Pokemon Center to obtain a Great Ball from the man inside. The Blackbelt in the house west of the Pokemon Center will give you a Poketch application called the Analog Watch, which is simply a regular, analog watch. Although there's no Pokemon Mart in this town, you can buy and sells items in the house at the north-west corner of town. Inside, the man with the sunglasses will give you BlackGlasses. Now, go to the center of the city and talk to the Galactic Grunt blocking the cave entrance. You'll battle him and he'll leave afterwards. An old lady, who turns out to be Cynthia's grandma, will come over to talk to you. You'll give her the Old Charm and she'll thank you for it. Now, go into the cave and examine the wall paintings at the other end. The old lady will then walk over to give HM03 - Surf. Keep in mind that you won't be able to use this ability until you obtain your fifth badge from Hearthome City. 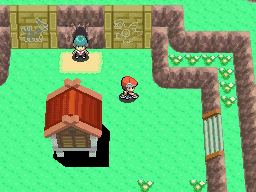 Once you leave the cave, the blue-haired man you met earlier in Mt. Coronet (who's name turns out to be Cyrus) will talk to you for a while. Now, head west onto Route 211. There will be a bunch of Berries to pick up at the beginning of Route 211. Go onto the raised land and talk to the guy facing south for TM77 - Psych Up. After learning Rock Climb, you can smash the rock next to the trainer and climb up the steep rocks. On top is TM29 - Psychic. Mt. Coronet is to the west, but you won't be able to do much more than pick up an Escape Rope. If that sounds too boring for you, fly over to Hearthome City. Another option, which is completely optional, is to visit Routes 219, 220, 221 now that you can Surf. I recommend going there now to train your Pokemon. However, you won't be able to go into Pal Park as of yet (where those routes lead to). Even so, you should still go. Below is the guide for those three routes. To start off on Route 219, fly over to Sandgem Town and head south. Go past the beach and start surfing south. You'll battle two children on land before going on more water. Surprisingly, Route 219, perhaps the shortest route in history, ends here! Route 220 proves to be longer and more exciting. You'll see a fork in the path. The right fork would be a good choice unless you could care less to battle only one trainer. The left path has a lot more stuff to do. Going down that path, you'll first battle two Swimmers. Go onto land to pick up an Ether. Then go to the other side of the rock to pick up a Splash Plate. It seems like there are more forks. The bottom-most fork will lead you to a single trainer. If you keep going east, you can find a Carbos. Going east further brings you face to face with more trainers and eventually takes you to Route 221. 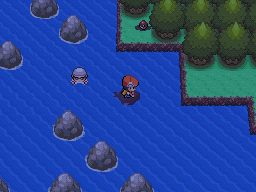 After battling the first trainer on Route 221, pick up the Protein you see on land. Soon, you'll reach solid ground. Battle the Fishman if you wish and then pick up a Honey. If you go up to the north-west corner, you can pick up a Pure Incense. At the north side, you'll find a house deep inside the woods. Show the old man inside a Pokemon at the level he requests (varies daily) and he'll give you a reward. Along the south side of the route, you'll be able to pick up some Berries. Once you reach the end, you can pick up TM81 - X-Scissor. You'll notice that Pal Park is closed and will only open after you obtain your National Dex.